The Huh? : New "Man of Steel" Superman trailer! Zack Snyder's new Man of Steel trailer is looking quite good! I also see his love for giant red capes in slow motion is still intact long after 300. Henry Cavill looks wonderful. I know I'm going to catch sh!t for this, but thankfully they ditched the absurd red trunks. Caught a couple quick glimpses of Zod, and Michael Shannon as the evil Kryptonian General is going to be great- especially after his performance in Take Shelter. I hope this film does for Superman what Batman Begins and Christopher Nolan did for Batman. At one point Kevin Costner, as Jonathan Kent, says, "You just have to decide what kind of man you want to grow up to be Clark. Whoever that man is, he's gonna change the world." The music and imagery seem to be very good at leading you to wonder at the struggle of an alien adopted into our world. He knows he will change the world, but the question he's forced to answer is how? Those are big choices, such a great burden, to put on the shoulders of someone. With extraordinary power, comes superhuman decision making skills. 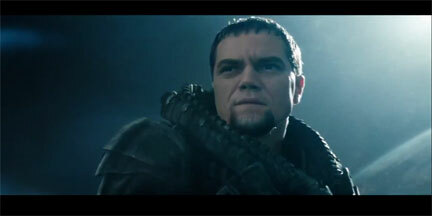 Here's a Zod screen cap i took as well.